Prominent & Leading Manufacturer from Surat, we offer outside garden bench and wooden texture cement bench. Shisham wood Texture RCC Garden Bench With 6mm Rain force Steel.It's Look's Natural Wood Bench and Comfortable to seat "for 4 person" Features: " We Are Ever Prepaid To Customize Color & Designing If There Is Quantity " Specially Garden ,Banglo, Hotels, School,College,Hospital's & Ashram & Public Place. Note: Prices are negotiable nad subject to changes. For the purpose of manufacturing the offered RCC Bench for Gardens in compliance with the industry set norms, our professionals make use of latest tools and equipment. 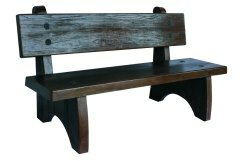 Owing to their elegant carving, impeccable finish and resistance to moisture, these benches are highly demanded. As per the specifications provided by the customers, these RCC benches can be customized. Features: Fine finish Water resistant Superior strength and excellent durability.